We make this often because it’s great flavor and can be made with any vegetables you like or have on hand. Today I went to the market and picked up tons of produce so we have a little bit of everything… Julienne cut carrots, yellow squash, red peppers, mushrooms, broccolini, and bok chop. 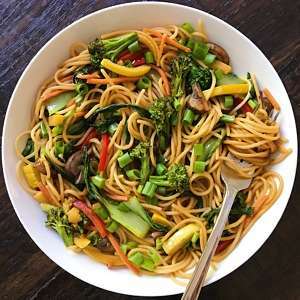 This is all you need: 2-3 cups chopped veggies of choice, gluten-free spaghetti, green onions and an easy lo mein sauce made of gluten-free tamari (or soy sauce), sesame oil, a little sugar and corn starch for thickening. Feel free to mix up the veggies and use your favorites! This dish is great on it’s own or along side any grilled protein of your choice. Gluten-Free and Vegan, this is a quick and easy crowd pleasing dish, perfect alone or with an additional protein. Recipe adapted from Pinch of Yum. Such a good recipe. I used edamame spaghetti noodles to increase the protein and it was delicious! So glad you liked it! 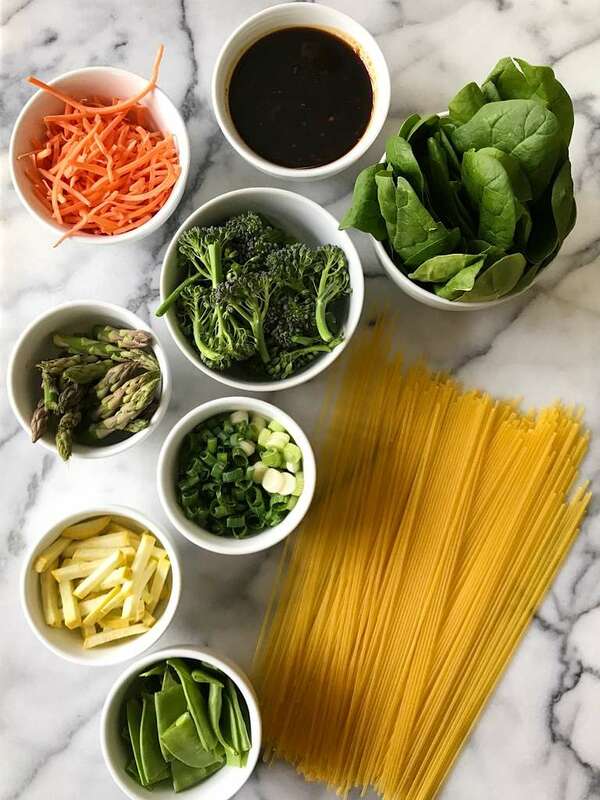 Edamame noodles is a great idea… going to have to try that! I made this last night and both my husband and I loved it! He added some shredded chicken to his and I kept mine vegetarian. I used red pepper, baby corn, zucchini, bok choy, and water chestnuts. As soon as my husband tried it, he said it could be added to the rotation! Aw, glad you love it so much and that this is husband approved! Thanks for sharing! Such a great recipe. I have tried many on this site and am so thankful I found it. I have a young baby at home and am able to make these meals easily. Thank you so much for your kind words Zena! So happy you loved this and other recipes! What else have you tried? yum! putting it on the meal plan this week!